Do you ever feel jealous of your friends who are able to go out and do things that you can no longer do because of your caregiving responsibilities? What about anxiety because things are out of control and you do not know how to bring them back into control? Think you are not doing a good enough job as a caregiver? Whether you become a caregiver gradually or all of sudden due to a crisis or whether you are a caregiver willingly or by default, many emotions surface when you take on the job of caregiving. According to Caregiving in the U.S., nearly half of caregivers consider their caregiving situation to be emotionally stressful. If there is one emotion that nearly anyone caring for an aging loved one can count on, it is guilt. 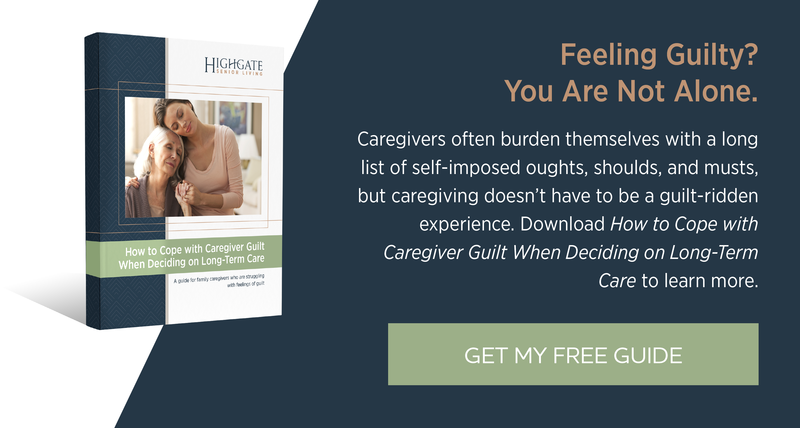 Caregivers often burden themselves with a long list of self-imposed oughts, shoulds, and musts. Sometimes known as “false guilt” or “disproportionate guilt,” this type of guilt only makes you even harder on yourself than you already are, which is not helpful to anyone. It helps to examine the ideas that underlie your guilt and consider whether they make sense to you. The following infographic outlines contributing factors behind why adult children experience caregiver guilt. Subscribe to the Monthly eNewsletter!